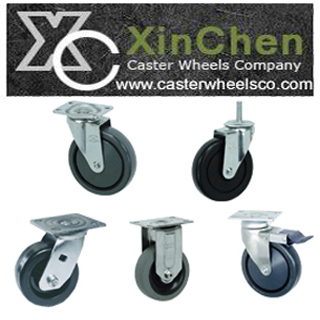 Xinchen caster wheels specialized in manufacture caster wheels,Our main business scope involved Medical caster:used as medical bed caster,hospital furniture caster,hospital trolley caster,central locking caster wheels Heavy duty caster: Rubber caster wheels,Iron cast wheels,widely used as industrial caster wheels,Plant / factory trolley caster wheel Trolley caster: widely used on super market trolley caster wheel,and home furniture cart casters Shock absorbing casters:Popular used as electric equipment caster,and high precision devices,which need avoid shocking. Low profile casters; Mostly used as machine casters,and industrial trolley. For many years development we have develop more than 2000 series caster wheels,And we are proud of our quality.